Update: Except where indicated otherwise, all facts presented in this article regarding conversations held between Dr. Langdell of Edge Games and Mr. Papazian of Mobigame (including events and timelines concerning the dispute between the two parties) have been taken from email correspondence between Mr. Papazian and Dr. Langdell, provided by Mr. Papazian and Dr. Langdell to The Escapist. - Ed. Regular readers of this or any of a number of other gaming sites will no doubt be familiar with the name Tim Langdell, the suddenly-infamous founder and CEO of Edge Games. Langdell has taken a beating in the gaming press over the past few months, spawned in no small part by a Gamasutra article first posted in late May that detailed a trademark dispute between Langdell and Mobigame, developer of the hit iPhone game Edge. The article essentially accused Langdell of holding the "Edge" trademark only to blindside anyone, across various forms of media, who happens to use the word. The word went out and Langdell soon found himself excoriated by gamers and the vast majority of the gaming press over his repugnant behavior. It's safe to say that forcing the removal of Edge from the App Store over a trademark violation opened a floodgate of anger and ill-will that nobody could have anticipated, but lost in all that self-righteous fire is the fact that Edge Games had not just a legal right but an obligation to demand a halt to the infringement, and that the wronged party in this case might actually be Langdell himself. 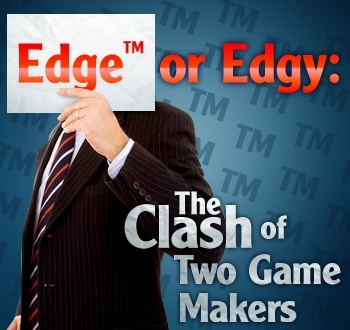 Due to the intricacies of trademark law, trademark holders - in this case, Langdell and Edge Games - are obligated to actively defend their trademarks or risk losing them to other parties. Disputes like the one between Edge Games and Mobigame aren't uncommon, and are usually settled amicably, but in this case the waters have been muddied by accusations of skullduggery on both sides. And considering Mobigame is a French company, Edge Games is based in the US, and the territories both companies are claiming in their dispute are world-wide, the case is tailor-made for confusion. "Trademark law is enormously complex, especially when dealing with multiple countries as we are in this case," said Greg Boyd, an IP attorney contacted by The Escapist. The language barrier surely hasn't helped, as many of the documents sent between the two parties, and forwarded by the parties to The Escapist, are in a mix of English and French. After careful review of the emails sent to The Escapist by Mr. Papazian and Dr. Langdell, (including emails sent between Mr. Papazian and his attorneys) this much is clear: A few months after the game was launched, Langdell attempted to contact Mobigame to inform the company of its infringement. When those efforts went unanswered, he contacted Apple instead, presenting it with proof of Edge Games' trademarks. Apple's decision to sidestep any potential legal entanglements by pulling the game from the iTunes App Store finally got Mobigame's attention and that's where the fun begins. First and foremost, despite Mobigame CEO David Papazian's assertions as recent as late April that he knew nothing of Langdell's "Edge" trademark, Mobigame's own lawyer acknowledges in an email that he was in fact made aware of the trademark at some point in March. Further emails between Papazian and his attorney, sent by Mr. Papazian to The Escapist, confirm that he was aware not only of the existence of the Edge trademarks but also the "serious" risks involved in challenging them, particularly in the U.S. It is unclear from the documents we've reviewed, or from Papazian's statements, what he intended to do about it. There has been considerable back and forth between the two parties (and in the press) regarding an offer made by Langdell to allow Mobigame to change the title of their game to "Edgy", which, in the opinion of Boyd, was a "very polite settlement offer ... If I were Mobigame's attorney, I would have advised them to accept it." Essentially, Langdell offered to allow Mobigame to use the title "Edge" in non-US and UK territories providing Papazian changed the name of his game to "Edgy" in the US and UK. This was by no means the first response from Langdell to Papazian regarding the situation, nor was it the first resolution he suggested. In fact, according to our research, and verified in emails sent to us by both Mr. Papazian and Dr. Langdell, Langdell at one point had suggested to Papazian that Edge would be seeking monetary damages for the use of the "Edge" trademark prior to their negotiations, but that request was later rescinded. "Because of the overwhelming support we have had and the fact that we are increasingly finding that legal position favours our continuing use of the name "EDGE" we have to consider this carefully."